As online networking becomes increasingly prevalent in our world, one UCLA alumni network – Bruin Professionals – is emphasizing personal contact and meaningful relationships as a method of expanding a member’s professional and social network. Launched in 2002 by UCLA alumni Mike Anderson, Randy Sheinbein, Mark Baker and Matthew Baker, Bruin Professionals (BP) seeks to engage alumni who are well-established in business in order to create a tightly-knit community of Bruins who interact socially as well as professionally. As the UCLA alumni group that is most focused on fostering business connections, financial gain is hardly the only goal of the network. In some ways, generating business is more accurately described as an organically-realized byproduct of the network’s guiding principles. “Our mantra is what we call the three Cs: commerce, camaraderie and community,” says BP president Dr. Bill Saleebey ’70, Ph.D. ’80. The commerce part — Bruins doing business with other Bruins — comes about via the camaraderie and sense of community that the meetings and special events seek to foster. Every month, each of the dozen regional chapters (most of them in Los Angeles County, with one in Orange County) hosts a meeting, which often features a speaker who is a subject or industry expert. 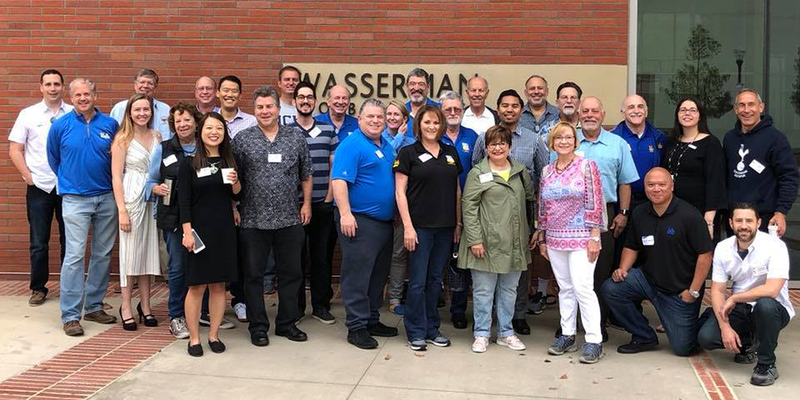 At a recent chapter meeting in Encino, the 20+ attendees were given the opportunity to briefly introduce themselves, update the group on recent activities, and thank their fellow members for referrals. They then settled in for a presentation by Ken Berke ‘84, a lawyer whose company provides compliance and payment solutions for the cannabis industry. After the formal portion of each meeting is over, the attendees are randomly divided into groups of three or four who then schedule a follow-up BP “mini” meeting. These informal gatherings — usually held over breakfast or lunch — allow participants to get to know each other in more depth and gain a fuller understanding of other members’ businesses as well as their personal qualities and character. The hope is, that over time, these interactions will develop into trusted relationships that are mutually beneficial on multiple levels. Within Bruin Professionals, two “affinity groups” emerged: one for real estate professionals and one for lawyers. A third, for technology professionals, is currently being formed. Tiffany Chin ’10 has been a member of the real estate affinity group for two years and also serves as Vice President of Programs and Events, a position in which she helps organize many BP-wide — as well as chapter-specific events — that are held each year. Notable events organized by Chin include a Los Angeles Lawyers Philharmonic concert at the Disney Concert Hall (featuring a BP member) and a holiday gathering at Nespresso in Beverly Hills attended by more than 100 people. On the horizon is an election information event in Culver City, where a representative from the League of Women Voters will lead the discussion and present on upcoming ballot measures from a non-partisan, informative perspective. 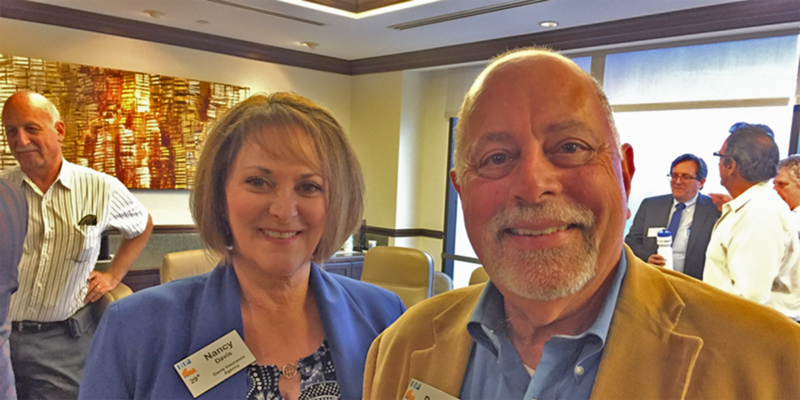 Bruin Professionals President, Dr. Bill Saleebey ’70, Ph.D. ’80 and Vice President, Scholarships/Charitable Giving, Nancy Davis ’76. BP’s connection with the greater UCLA community is exemplified in part by its philanthropic efforts. Davis, who took over this year as head of charitable giving for BP, said that members are encouraged to give back and that the Bruin Professional Alumni Scholarship Fund is roughly half-way to their endowment ($100,000), an important milestone. BP members must meet certain minimum requirements that indicate they are “seasoned professionals or well-established in a business (minimum three to years).” They must also be Alumni Association Gold, Life or Blue Members and have a strong affiliation with UCLA (e.g., degree-holder, staff member, long-time supporter, etc.) Members must be in roles in which they are looking for new business or looking to refer their clients to third parties. Dues are $425 per year. Click here for more information on joining Bruin Professionals.